You have issues that are of special pertinence to seniors, from mental and physical health care to financial and physical security, education, access to social life, the demands of being carers, the demands of being cared for, housing, travel, pensions, the vulnerability to suicide of elderly males in particular and a host of other matters that require a response customized around the changing needs of your constituency. They require careful and insistent advocacy and you have helped bring fresh focus to many of them. However, your remit extends way beyond issues that are of immediate and intrinsic interest to seniors and reaches to the wider sphere of civic and political life where your contribution is needed more than ever. Living as we are through these humbling days, when we see the ghastly consequences of mistaking a culture of speculation for enterprise, we need wise counsel and determined voices to rouse us from the pit of paralyzing fatalism and spur us on to finding and implementing solutions. Who better to be involved in the national discourse we need right now than those who know from the deep wells of lived lives just how essential individual initiative is and how powerful civic spirit can be in moving through and beyond difficult times. Our young generation are the best educated we have ever produced, the healthiest, the most ambitious and sophisticated but they face a landscape of diminished returns that they never contemplated having to face. Most of you by contrast faced little else over a lifetime but struggle against tough and implacable odds. You remember many different Irelands in which lives were constrained and even wasted by poverty, lack of access to education, the drain of emigration, the recurring misery of conflict, the attitudinal barricades that held back the potential of women in particular, the narrow biases that kept heads and hearts down. You also remember the leaders who emerged in homes, schools, communities and politics to galvanise the fresh energy and vision that brought Ireland from ceann faoi to can do. You know that we face difficulties not impossibilities and, through these times, your guidance and encouragement are utterly essential. Already many seniors are filling the gaps in child care, in economic support to the next generation. They are the backbone of the massive volunteer effort that deepens and enriches civic life in every corner of Ireland through sports clubs, charities, choirs, drama groups, self-help groups, parish teams, adult education, youth clubs, homework clubs and all the rest. For social entrepreneurship our seniors cannot be beaten. It was they who responded to the needs of emigrants to Ireland for befriending and language tuition with the Fáilte Isteach programme. It is they who are filling the child care gaps and helping their families through economically vulnerable times. They are the carers for the infirm even at times when they are infirm themselves. We are extremely fortunate in Ireland to have so many active senior citizens investing in our families, community and country whether through organisations or on their own initiative. They are an often taken-for-granted social asset; a backbone and reliable network of endeavour which adds hugely to our individual and collective coping skills. 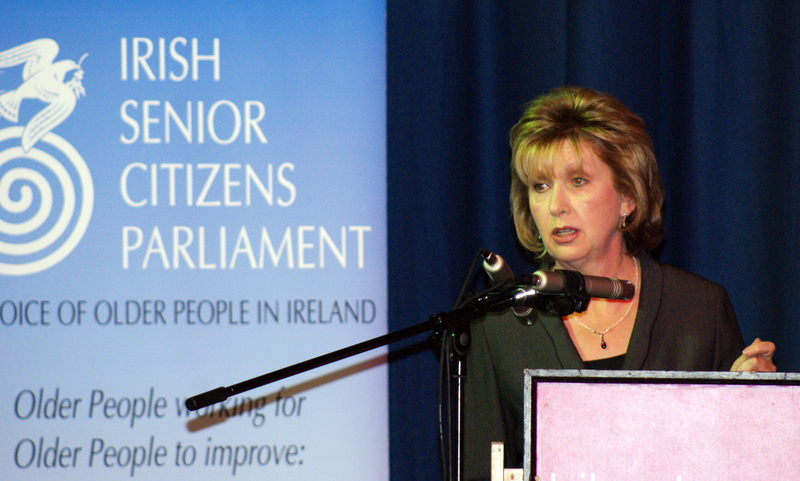 The Irish Senior Citizens Parliament is a stellar example of older people working for older people and for Irish society, infusing it with their vitality, vision and distilled wisdom. Sylvia Meehan is a classic example of the surging energy and potential of Ireland’s seniors and it was great to see her recognised in 2009 when she was presented with the ‘People of the Year Award.’ Sylvia’s belief that change is possible with focused effort, has been vindicated time and again and I wish her well in her future endeavours. I congratulate all the members of the Senior Citizens Parliament for being the persuaders for change and the catalysts for change. Life has changed for Ireland’s seniors beyond all recognition. There are wide and accessible horizons now that would have been unthinkable a generation or two ago. There is greater longevity and greater ambition to live life to the fullest possible, to be fully of these times and no mere spectator. They are texting, skyping and blogging. They are learning new skills and sharing old ones. They are running marathons and running homes, multi-tasking in retirements that put a whole new gloss on the concept of retirement. Benjamin Franklin once said “We do not stop playing because we grow old; we grow old because we stop playing”. The Irish Senior Citizens Parliament is a repository of irrepressible joy in life, curiosity about life, faith in life and faith in one another. It is about people helping people to live better and to flourish no matter how many miles are on the clock. I wish you well with this annual meeting and continued success in the future. Well done on having a dedicated parliamentary group representing the elderly in Ireland. My elderly mother lives alone in Dublin and is 88 this year. I am delighted that there is a group such as this representing and trying to protect her needs. Thank You.